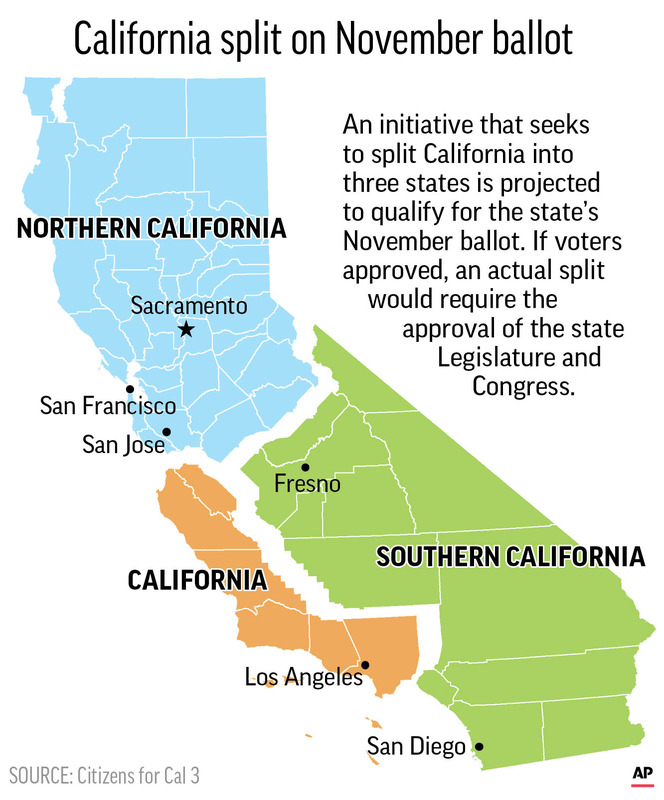 Graphic of the State of California shows the divisions of a proposed initative to split the state into three states. (CN) – Delivering a blow to a Silicon Valley billionaire, the California Supreme Court on Wednesday erased a November ballot measure proposing to divide the Golden State in three. Following a closed session Wednesday morning, the state high court directed elections officials to remove Proposition 9, dubbed “Cal-3,” from the November ballot. The panel says it will rule later as to whether the initiative by Tim Draper should be allowed to come before voters in the future. The state cleared Draper’s measure for the ballot in June, finding proponents had collected more than the required 419,000 valid voter signatures. The ambitious initiative seeks to create three states – Northern California, Southern California and just California, which would cover Los Angeles and parts of Orange County. The effort to freeze Draper’s measure is being led by the Planning and Conservation League, which asked the court last week to strike the initiative from the ballot. The group says the measure should be subject to higher qualification standards because it calls for drastic changes to the state constitution. In addition to future scrutiny from the high court, the proponents face a laundry list of logistical, legislative and legal hurdles to break up California. Splitting up the nation’s most populous state would present monumental redistricting challenges, add four new U.S. senators and require the new state governments to figure out how to redistribute existing debts, water infrastructure and other assets. If ultimately successful, it would mean the first split state since the Civil War, when West Virginia broke from Virginia in 1863. The high court order states that while the justices traditionally review disputed ballot measures after an election, the conservation league has raised “significant questions” about the proposition’s validity. “We have also made clear that in some instances … it may be appropriate to review a proposed measure before it is placed on the ballot,” the order states. The panel ordered the parties to submit further briefs regarding the conservation league’s petition by Aug. 20.